When looking at photos of permanent eyebrows, you must keep in mind that the immediately after “fresh” photos always look more vivid than the healed photos. The photo below is a 1 1/2 years faded brow with the hair stroke technique over the top. I like this type of technique because I’m basically hiding the hair strokes in the shading so you have a nice dimension without seeing the tattooed look of harsh shading or hair strokes. Just for fun, before reading on, pick which photo appeals to you the most? The photo below is a shaded brow with the hair stroke technique over the top. 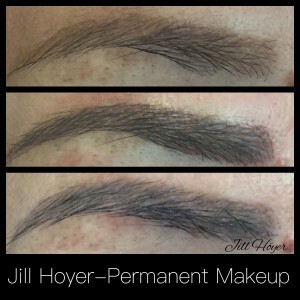 You can see that the middle photo is “fresh” and just how prominent the hair strokes/microblading appears. The strokes always look more like real and hair like the day they are done. Once the hair strokes heal they are still pretty but they are not as vivid as the fresh /immediately after photo. Reality Check!! We are often too wowed by the immediately after photos on social media, which often portrays a false sense of reality once the brows are healed. I explain this to clients every day before I start a procedure so we are on the same page. I educate my clients that once the brow is fresh and just done, there is color on the top layer and underneath the top layers of skin. As the color heals, the top layer of color is exfoliated off and the remaining color is viewed through several layers skin. Which in turn, will look duller than a fresh, immediate after tattoo. Many clients love their brows or eyeliner the day its done (aside from some swelling and the color being too dark), the color is on top of the skin and the vividness is a closer match to topical makeup, which most clients are used to seeing. Using a little topical makeup over the permanent makeup will give the look you maybe use to which you can’t get with permanent makeup. I also recommend trying some oil over your permanent makeup to give the color a nice pop and help keep skin healthy.